This semester I was offered the great opportunity to intern for working ceramicist Julie Guyot. Julie graduated with her BFA in ceramics from Southern Illinois University at Carbondale in 1994 and her MFA in studio art from Florida State University in 2008. 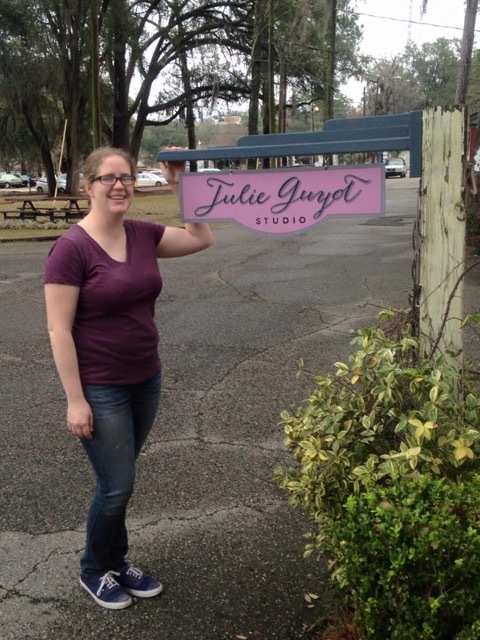 She now works from her studio and store front at Lake Ella. The tasks I do around the studio vary but all relate to successful business and studio practices from the basics of wedging clay and mixing glazes, to packing and shipping work. The work I do allows Julie to focus on the production and decoration of each piece. But it’s not all work no play. Our days together are filled with different conversations. We have discussed topics like: how to sell your work legally, whether to be a hobbyist or small business owner, surface decoration, hand building methods, other artists, and my own personal and school related projects. I find these to be the most valuable moments at this internship. So why did I choose Julie? I too am a ceramicist and I plan on having a studio and selling my work in the future. Even though Julie hand builds and I throw on the potter’s wheel, I still am learning a great deal. One of my main goals for this internship was to learn and practice more hand building techniques. Just seeing how Julie goes about creating her forms through templates, bisque molds, and finger impressions has been really encouraging. Also, seeing the methodology to her art and knowing the reason behind it, makes me think not just about her work but mine as well. Two of my most enjoyable times so far at this internship have been exploring glazing a new form and her Grand Opening night. Earlier in the semester Julie made some new vase shapes. 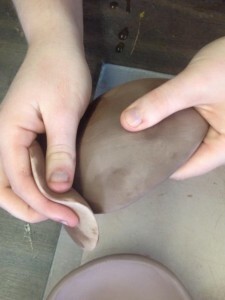 When it came time to glaze it we bounced ideas around on how exactly to glaze the object. It was refreshing just to be able to share my ideas and have someone run with them instead of critique them. Grand opening night was just filled with excitement. Even though I wasn’t on the clock, I volunteered to stay as long as I could. I rang up sales, mingled and met new people. It was a great opportunity to build my confidence and my network. So far all my experiences have been a positive influence on me and my work. I would recommend getting an internship with a working artist in your field. Whether it be with an artist doing exactly what you want to do or an artist that will provide you with the experiences to have yourself and your art grow.